Symbolism of feathers often refers to ascension and spiritual evolution to a higher plane. Feathers were worn by Native American Chiefs to symbolize their communication with Spirit, and to express their celestial wisdom. Also in the Native American Indian culture, feathers represented the power of the thunder gods, along with the power of air and wind. As a Celtic symbol meaning, the feather was worn by Druids in the form of ornate feathered robes. Celtic Druids donned these robes in ceremonies to invoke the sky gods and gain knowledge of the celestial realm. It was believed that the feathered cloak along with the presence of the sky gods would allow the Druid to transcend the earthly plane and enter the ethereal realm. In Christianity feathers represented virtues. In fact, an image of three feathers were made into signet rings – each feather symbolizing charity, hope, and faith. These rings were worn as a symbol of a virtuous soul – they were also used as wax seals. The ring would be dipped in warm wax then pressed against documents to seal the closure. The recipient would know the documents came from a virtuous man by the indication of the three-feather symbol in the wax. As someone who is surrounded constantly by feathers, because all the birds shed them constantly, I find this fascinating! Thanks Robyn! Then it is a very accurate discription of what comes from your always loving, sharing and embracing heart…your love! Beautiful post my sister! Thank you Wendell! So much appreciate!! Symbolism seems to be everywhere in our lives and how dare we miss it when it comes in such a beautiful form as feathers. I too love the music and it’s now part of my collection. Thank you for sharing. Very interesting article. The Cherokee part of me is fascinated with all things Native. Feathers have always fascinated little girls and some of us just never grow up!! 🙂 yes I do love feathers — have a small collection actually!! Aww thank you so much jalal!! I am glad you enjoyed – and yes – truly enjoyed your post — so much believe the same! I believe that birds are messengers. We find what we are looking for even when we’re not trying, serendipity in a feather. 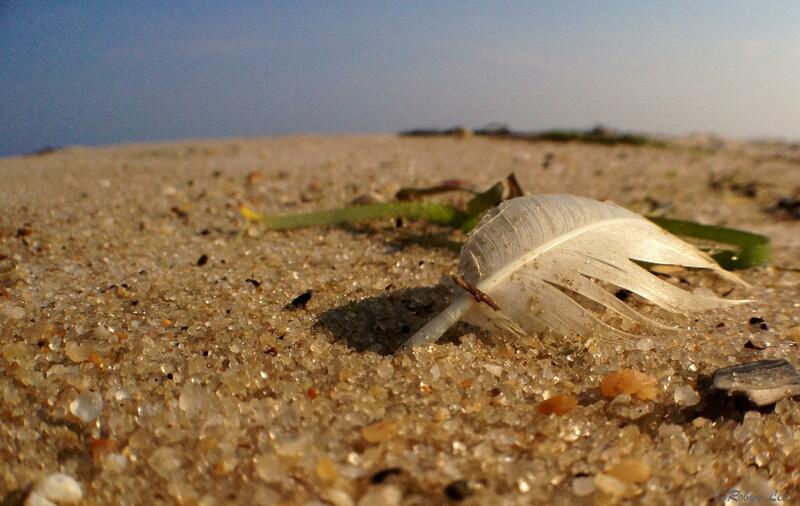 The feather on the beach is the same shape as the curve on the horizon, lovely photo. Thank you – I agree — the birds are very much the messengers and feathers tell us many truths if we take the time be with them. I was browsing your posts when I came across the symbolic meaning of feathers. The link to birds, feathers, Angels and spiritual guides, seems to be uppermost in our times. We are perhaps all searching for something more than this existence, ascending to higher realms, through love, acceptance, peace.